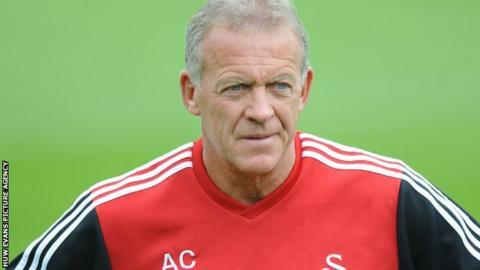 Coach Alan Curtis has hailed Swansea City's current squad as legends after they secured a Capital One Cup final spot. Swansea will face Bradford City at Wembley on 24 February after overcoming Chelsea over two legs in the semi-final. "These guys will go down as legends of this club," Curtis said. "If we can win the final it will be the biggest achievement within the club's 100-year history." Curtis, now a first team coach, made over 350 appearances in three spells with Swansea and was a key man in John Toshack's side which played in the old First Division in the early 1980s. But the ex-Wales striker has also experienced the lows and was a member of the coaching staff on the day Swansea escaped relegation to the Conference in 2003. "Getting into the First Division years ago and winning promotion to the Premier League was phenomenal," Curtis told Swansea City's official website. "But if you can win a major trophy at Wembley, then that would top it. It is beyond our wildest dreams." Swansea have played at Wembley previously and famously beat Reading 4-2 to win the Championship play-off final in 2011 to secure promotion to the Premier League. And at the old Wembley in 1994 they beat Huddersfield Town on penalties to win the Autoglass Trophy. But victory over League Two Bradford City on 24 February would give Swansea their first major piece of silverware in their history. "It sounds crazy doesn't it? It has been an incredible journey," Curtis added. "In all my time at the club, there has probably been more lows than highs, but I must say when the highs have come along they have been incredible highs. "So it's a fantastic achievement for us to reach a major cup final. It's building up to a fantastic day at Wembley."